An abbreviated version of this story appeared in the November/December 2016 issue of Taps magazine. 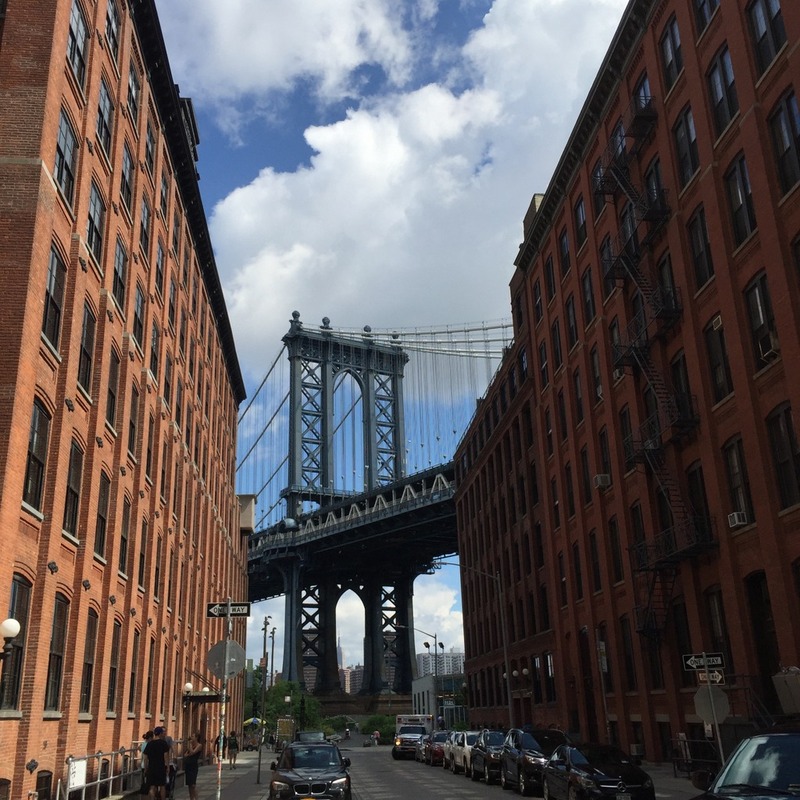 Forty-eight hours in Brooklyn. Just two days. It isn’t much time to really explore a city’s beer scene, but it was all I had, so I did what I could. From my base at the Dazzler Brooklyn Hotel, centrally located near the entrance ramp to the Manhattan Bridge, I spent Saturday afternoon and evening in breweries and beer bars in the south Brooklyn neighbourhoods of Gowanus, Crown Heights, and Carroll Gardens. 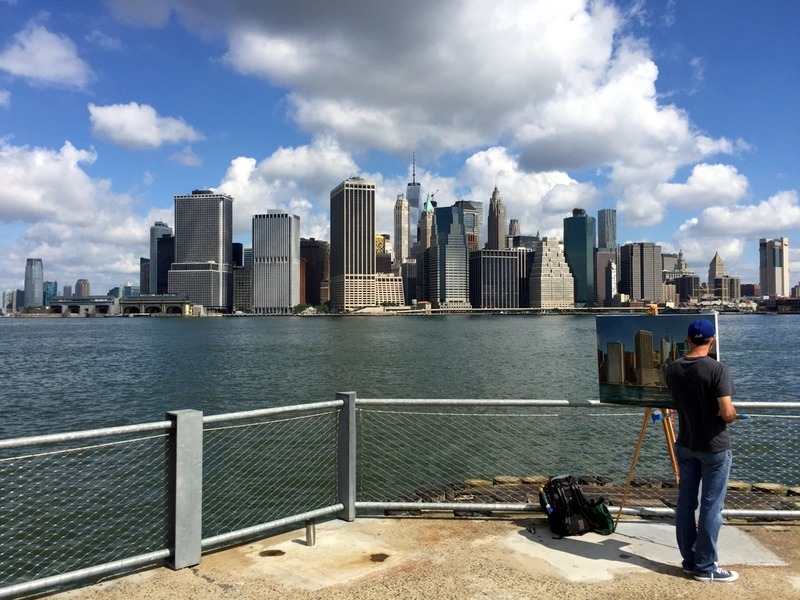 On Sunday, I cycled from my hotel and rode up to Williamsburg and Green Point to the North. On Monday, I squeezed in one more stop before my flight home. The entrance to Threes Brewing takes you into a long narrow room, not much wider than a hallway with a row of small booths along one side, that opens into the main bar area at the back of the building. 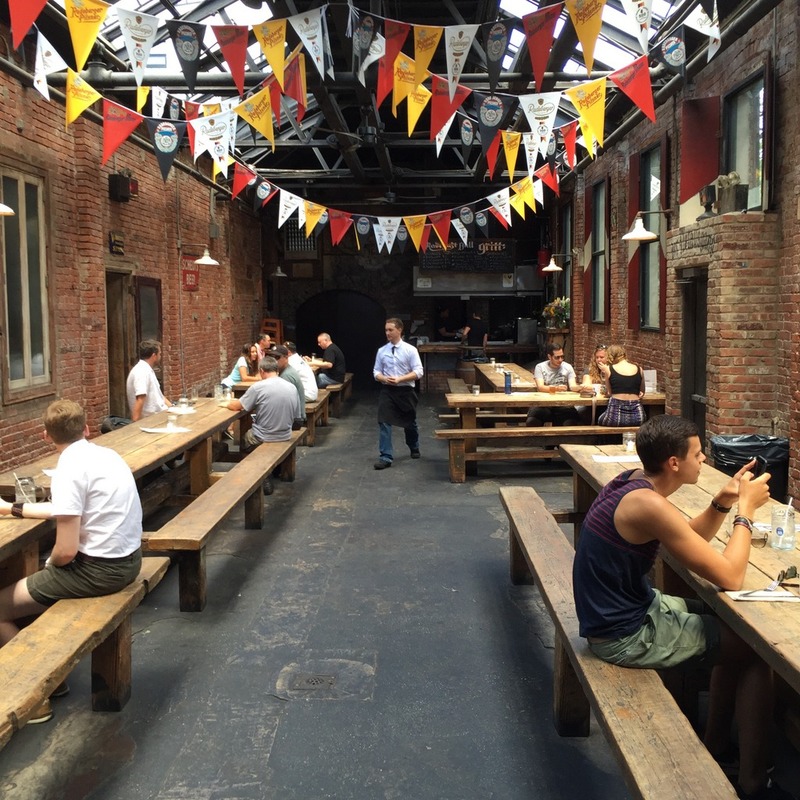 Beyond that is “Threes Yard,” an attractive outdoor patio area with several small tables, communal long tables, and benches without tables. A hop-covered trellis covers one side and a cloth awning angles over the other. The sunlit patio drew me out of the dark bar area to a seat at a small table. About half of the other tables were occupied—the larger ones by groups in their 20s or 30s enjoying weekend brunch. I followed their lead and ordered a Felimon Burrito filled with scrambled egg, black beans, and Oaxaca and cheese. I could have stayed all afternoon, but a large engagement party arrived and I felt like I was hogging a table while others were forced to stand. And my time was tight, so I left to check in to my hotel, already imagining a future return visit. Beers sampled: Threes Brewing Table Beer saison and Chronic Myopia IPA. Both were excellent. After checking in and unpacking, I headed back out for dinner and visits to a couple more breweries. 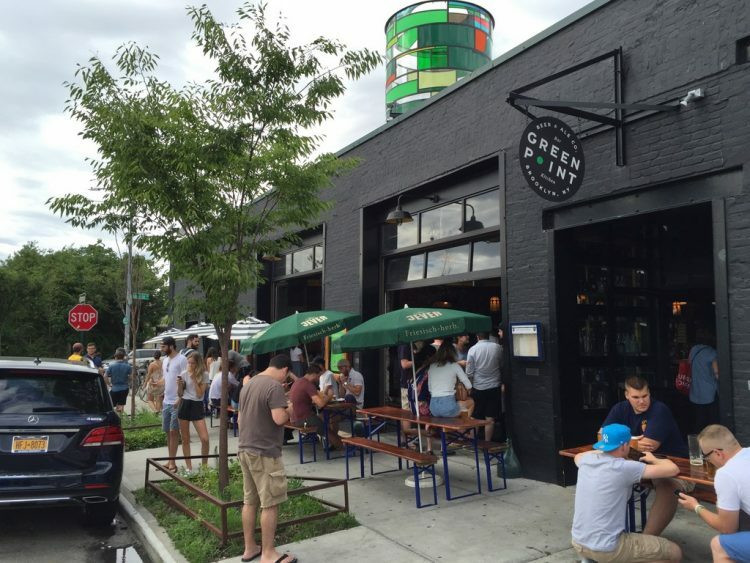 Berg’n is not a brewery but a big beer hall, with three rows of communal tables in front of a long bar, four food vendors at one end and an outdoor patio at the other. The patio was booked by a wedding party, so I sat at the bar. The place was close to full, including several families with young kids. The Yankees game played on the big screen without sound; light music played on the speakers. While I decided what to eat I ordered a gose, which turned out to be more sour than I expected. I had noticed the same thing when I tried a couple other goses in Washington, DC, earlier in the week, so maybe it’s an East vs. West Coast approach, or a Canada/US difference. I ordered brisket from Mighty Quinn’s Barbecue, along with a pilsner that cleansed my palate nicely after the overly tart gose. Berg’n seems like a popular spot for locals. Tuesdays are Trivia Nights and Wednesday nights are all about board games. Beers sampled: Suburban Beverage gose by Perennial Artisan Ales (good, if surprisingly sour); Bohemian Pilsner by von Trapp Brewing (excellent); and Meek Millet, a farmhouse ale from Other Half Brewing (interesting if not amazing). Inside, the aesthetics didn’t improve. The tiny, square tasting room’s rough decor was dominated by a large antelope head mounted on the wall (a kudu, judging by its spiral horns). Loud music bombarded the dozen or so beer lovers inside, and there was nowhere to sit, so I propped myself in the corner, next to the kudu. 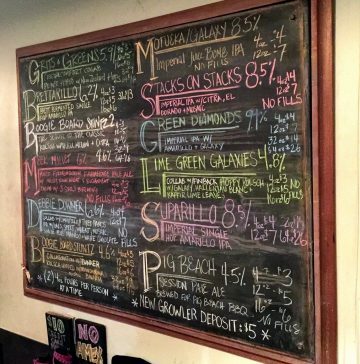 The chalkboard beer menu on the wall behind the bar offered some great choices. I tried a couple, but the brewery only offered full glass pours—no sampler flights—and the room’s vibe wasn’t working for me, so I soon went to another nearby brewery. Beers sampled: Other Half Brewing’s Brettarillo (good but not very Brett-forward), and a collaboration beer called Debbie Downer, a multi-grain IPA with mango and white chocolate, which was a mixed bag. Maybe visit during daylight hours when it isn’t quite so dingy. Strong Rope is about five blocks southwest along 4th Avenue from Threes Brewing, where I started my beer explorations earlier that afternoon. Behind its green-framed door, I found a welcoming taproom with a live-edge bar top and several tables along the whitewashed brick walls. 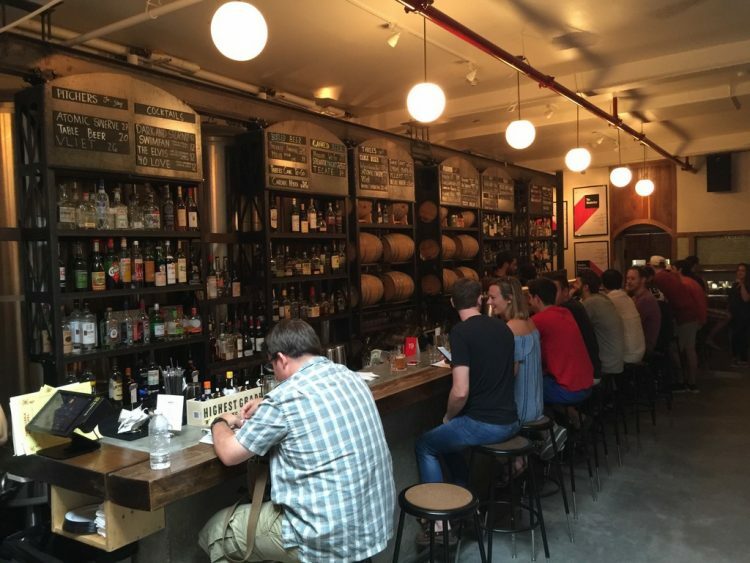 The bartender told me that Strong Rope is classified as a farm brewery: 100 percent of the hops and about 95 percent of the malts they use are grown in New York state. The menu was dominated by malt-forward styles, which probably reflects the lack of diversity of hops grown in New York; none of the three I tried had a big hop presence, but a couple of them were quite good. With another big day ahead, I called it a night after Strong Rope. Beers sampled: Strong Rope’s Young Lion of the West, brewed with malted corn and barley as an homage to Genesee Cream Ale (tasty); Far Country Rye, malty with a rye undertone; and Icarus Predicament, a honey red rye ale that was a little too dominated by the honey. 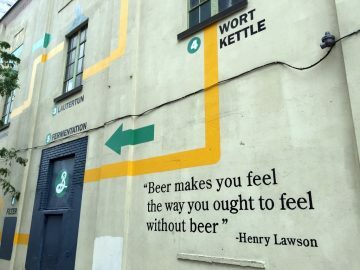 Visit if you are more of a malt-meister than a hop-head. Sunday was my bike day. The Dazzler Hotel loaned bicycles, and the day was forecast to be hot and sunny, so I planned my route over breakfast and got a bike from the front desk. This turned out to be a low-slung cruiser model with high handlebars and a laid-back setup that made me feel like I was going to fall off backwards, but it was free and I didn’t want to waste time tracking down a more comfortable bike on a Sunday morning. I put a few basics in my daypack, tossed my phone with Google Maps up and running into the bike’s basket (yes, a basket) and took off. Once I was riding, the bike’s automatic transmission offered me another challenge: it would shift—clunk—into a higher gear just as I got up to a comfortable speed. Then, as I struggled to pedal at the new ratio, it would suddenly—clunk—shift back down. Awkward! 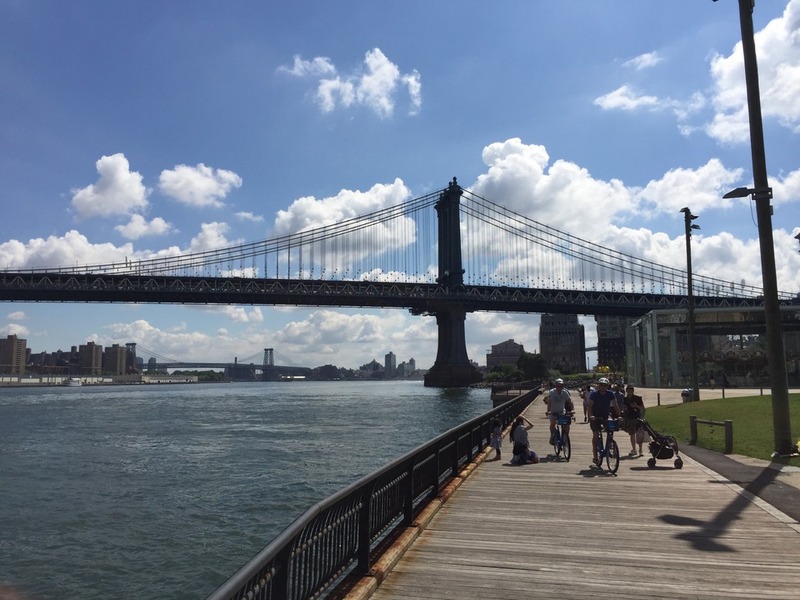 The goal of my Sunday ride was Williamsburg and Greenpoint, two neighbourhoods that extend north of downtown Brooklyn along the East River. But I wanted to do some sightseeing first, so I headed south into Brooklyn Heights and turned west to the shoreline where a series of piers have been converted into the Brooklyn Bridge Park, with its walking/biking paths, volleyball courts, picnic areas, gardens, and other green space. The view of the Manhattan skyline was incredible, and while there were a lot of people out, it wasn’t so busy that I couldn’t ride. Following the park north and then east as it continued under the Brooklyn Bridge and Manhattan Bridge, the bike path emptied into the DUMBO (Down Underneath the Manhattan Bridge Overpass) neighbourhood. From there, I rode around the Navy Yard film studios and then north into Williamsburg, known for both its large Hasidic Jewish community and its status as world hipster headquarters. It was too early to stop for beer, so I pumped away on my increasingly uncomfortable bike through Williamsburg and into Greenpoint. 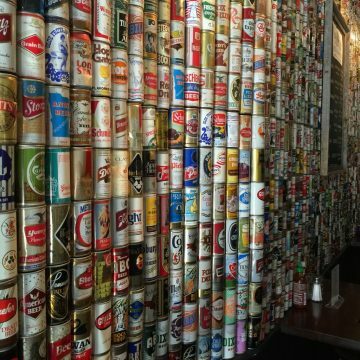 Joshua Bernstein had recommended Keg & Lantern Brewing as an “amazing, under-the-radar brewpub.” It is an older bar that looks like it hasn’t been redecorated since the 1970s, complete with a wall of old beer cans and a stereo playing Kansas and Pink Floyd. 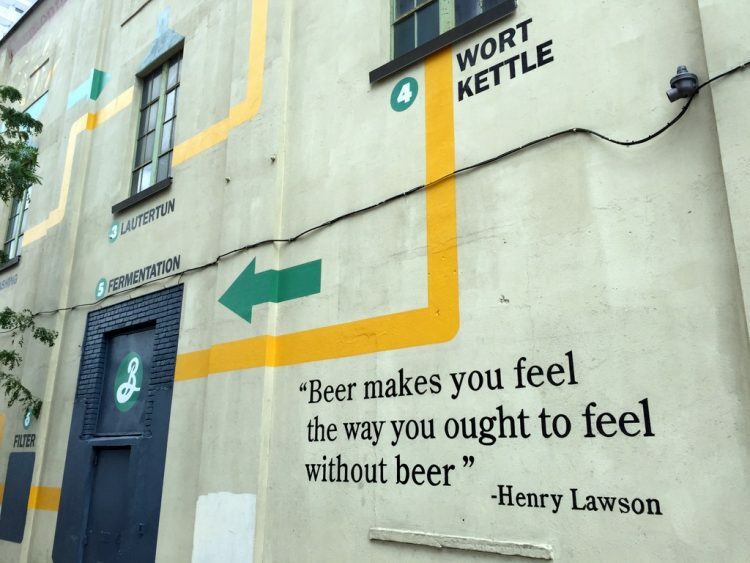 The brewery was added about two years ago. It opens at 11:00 a.m. for brunch, when few other breweries are open on Sunday, but I just sampled a couple of beers and watched Milos Raonic lose to Novak Djokovic in the Wimbledon final. Beers sampled: Keg & Lantern’s Golden Ale was a delicious thirst quencher after my long, sweaty bike ride, and the Mirage Session Ale was sufficiently hoppy. Recommended especially if you came of age in the 1970s. As noon approached, I walked my bike around the corner and locked it up in front of an innocuous door with TØRST barely visible on the sign above. Considered perhaps the best beer bar in the world, Tørst was founded by former Danish schoolteacher Jeppe Jarnit-Bjergsø, whose bottle shop in Copenhagen was rated the best beer store in the world by ratebeer.com. His brother, Mikkel Borg Bjergsø, operates the highly regarded Mikkeller brewery in Denmark. When Jeppe decided to also brew beer, he called his venture Evil Twin Brewing. Instead of opening its own facility, Evil Twin works with the best breweries in the world to collaboratively produce its very unusual and highly regarded beers. 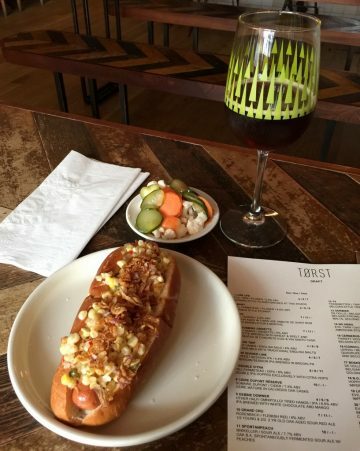 He made Brooklyn his home base and opened Tørst (Danish for “thirst”). Canadian chef Daniel Burns runs the kitchen at Tørst, and we have a common friend, so I asked for Burns when I ordered my first beer. The very professional and knowledgeable bartender told me he had just stepped out for coffee, so I staked out a spot at the front of the room. When Burns returned, I introduced myself as a friend of John’s, earning an immediate smile and an invitation to chat. Burns grew up in Halifax, lived and worked in Vancouver for a while, and then moved to Europe. In Copenhagen he worked at Noma, which has rated in theworlds50best.com’s top five restaurants since 2009, and held the top spot in 2010, 2011, 2012, and 2014. After Noma, Burns returned to Vancouver, but found the restaurant scene hadn’t changed much so he moved to New York. He and Jarnit-Bjergsø met at a beer tasting event, struck up an immediate friendship and decided to work together. Burns gave me a tour of the building, and we discussed beers in the beer cellar for quite a while, until he had to get back to the kitchen to prepare for the evening’s two seatings. In addition to serving an inexpensive menu of gourmet snacks to bar patrons, Tørst also operates a tiny 26-seat restaurant called Luksus (Danish for “luxury”) in its back room, where a Burns-designed seasonal tasting menu is served five nights a week. Reservations are required, and even with a price tag of $125 per person, they fill up well in advance. 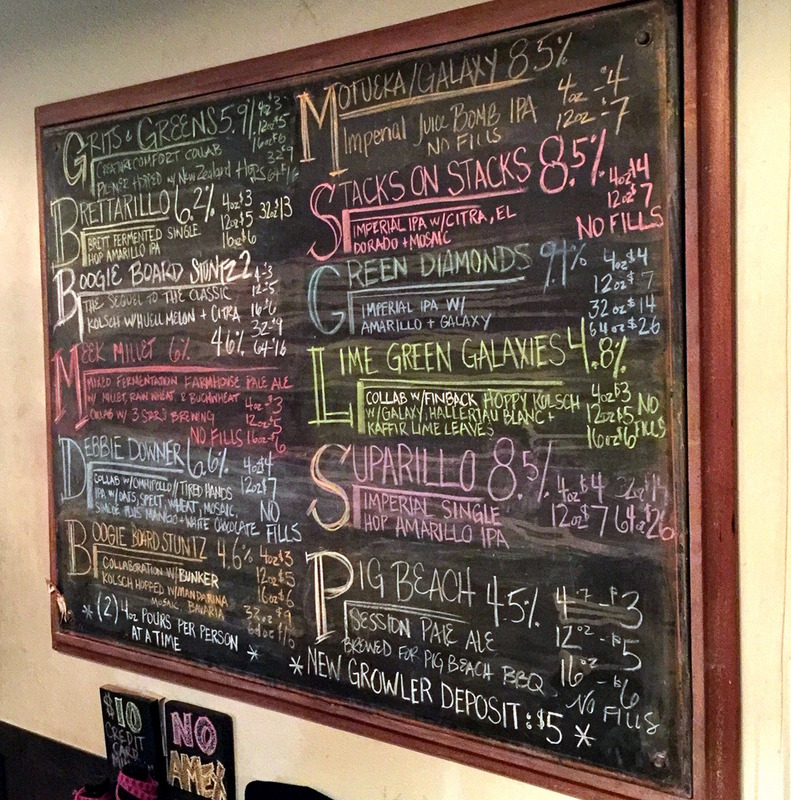 I returned to the bar and sampled a few more beers from the incredible tap list. Unlike many of the breweries I’d been to in Washington and New York, Tørst offered four-ounce samples, so I was able to try more than two or three beers without becoming too wobbly to cycle. Eventually, reluctantly, I left and got back on my bike, a little wobblier perhaps than I should have been. Beers sampled (all excellent! ): Evil Twin’s Low Life pilsner; La Saison √225 from Swiss brewery Brasseries des Franches-Montaignes, aged in St. Bon Chien wine barrels (fabulous oak barrel character and tartness); Throbbing Grisette from Tired Hands Brewing; Grand Cru from Rodenbach; Spontanpeach from Mikkeller; and Oerbier from Belgian brewer De Dolle. Highly recommended if you like “fancy-pants pours,” as Josh Bernstein described it. 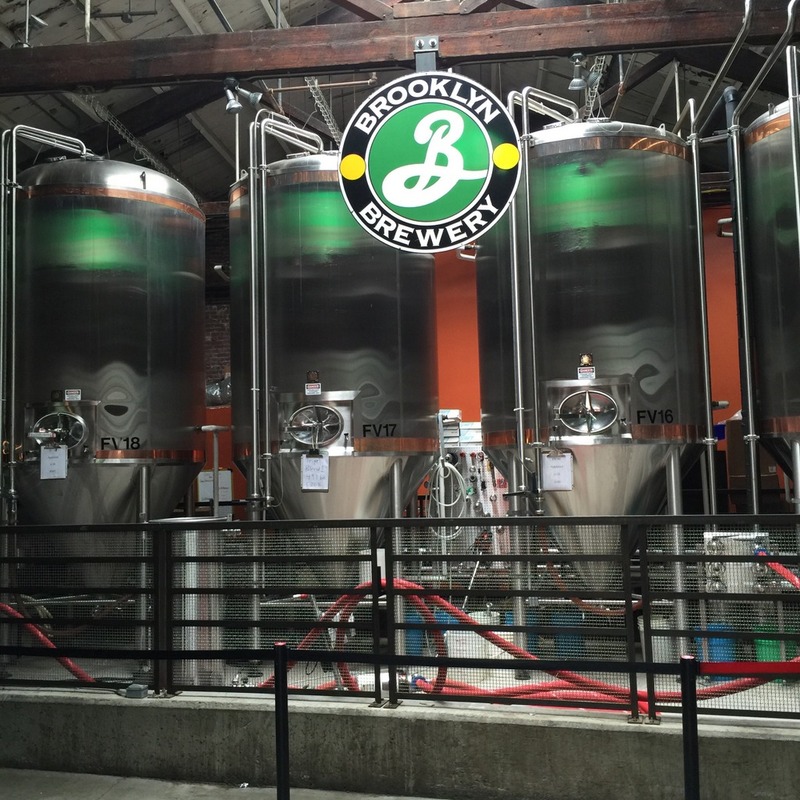 Founded by Steve Hindy and Tom Potter as a contract brewery in the 1980s, the actual brewery in Brooklyn opened in 1996 under the guidance of brewmaster Garrett Oliver. Based in a big old warehouse, the brewery’s tasting room is open to the public on Friday evenings and Saturday and Sunday afternoons. Tasting tokens are $5 each or five for $20. Free tours are offered on weekends, and Small Batch tours can be booked in advance for weekdays (except Fridays). Most of the dozen or so picnic tables in the tasting room were full, and there was a long line at the bar. The room was too loud and echo-y for me, so after a couple of beers, I got back on my bike. Beers sampled: Brooklyn’s Area 291 IPA (cask); Bel Air Sour (very tasty). Check it out if you’re already a fan. It turns out I had ridden past Greenpoint Beer & Ale earlier in the day—I recognized the beautiful, multicoloured, stained glass water tower on the roof as I locked my bike up across the street. People streamed in and out of the three open garage doors and a TV announcer’s voice emanated from within. In the jam-packed tasting room, the Euro soccer final showed on a big screen on the far wall. Perfect! Then two guys right in front of me at the bar got up and offered me their spot. I sat down with a perfect sightline to the screen. The chalkboard menu on the wall had a dozen Greenpoint beers as well as some imported German beers. It was an impressive list: several of the brewery’s beers were Brett-conditioned, saisons, or sours—exactly the sort of thing I like. I sampled four over the course of the soccer match. All were excellent and I’d have been happy to keep going through the list, but I was already pushing the rules of the road, and I needed to be alone with my disappointment over France’s loss to Portugal. Beers sampled: Greenpoint’s Homeboy’s Whim (a Brett-conditioned patersbier); Blanc Canvas (a Brett saison with Hallertau Blanc hops); Hook Line & Sinker (a solid pilsner); and Autonomation (a session IPA). With big plans to visit another brewery or two that night, I returned the bike to the hotel, took a shower, and lay down on my bed for a couple of minutes. A few hours later, I awoke in a daze. Where was I? What time was it? I guess the combination of the hot, humid weather, the physical exertion of the bike ride and all the beer had caught up with me. In need of food, I dragged myself out and walked to Habana Outpost, which I’d passed on Saturday. It was movie night—the 80s classic, Weird Science, played on the wall of the building next door and the courtyard was packed with people of all ages. I had a Cuban Sandwich with rice and beans, washed down with a Sixpoint Bengali IPA. When the cheesy movie was over, I went back to bed. 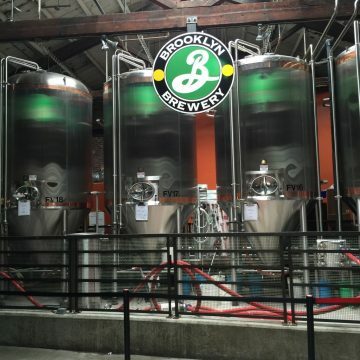 With my flight home from LaGuardia International in Queens scheduled for mid-afternoon, and some family gift shopping still to do, I didn’t expect to get any more beer-related visiting in on my final day in Brooklyn. But I had a 90-minute window after shopping and checking out of my hotel, so I ordered an Uber ride back to Williamsburg. Radegast is about as close to a German or Czech beer hall as you can get without travelling to Europe. One side is an indoor restaurant space, and the other is a mostly enclosed beer garden with long wooden tables, Oktoberfest-style beer banners strung below the skylights and a sausage grilling station at the back. I ordered a Currywurst and a German Pils, and figured that was all I’d have time for. Then my departure was delayed by 90 minutes, giving me more than enough time to enjoy a second beer! Beers sampled: Radeberger Pilsner Zwickl; and a very delicious Schneider Wiesen Edel-Weisse. Recommended if you’re an honorary Oktoberfester. Finally, however, my time in Brooklyn came to a close. 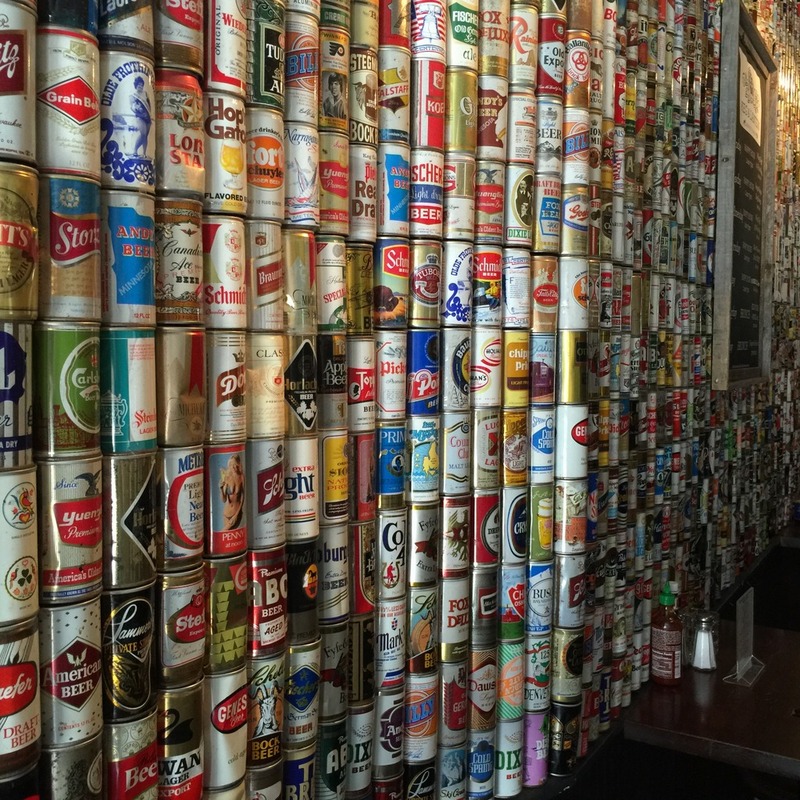 It was a whirlwind visit for sure, but I felt like I’d at least scratched the surface of the beer scene there. The highlights were clear: Threes Brewing and Greenpoint Beer & Ale were my favourite breweries, while Tørst and Radegast were the two best beer bars I’d visited. I can’t wait to return and make more discoveries. Joe Wiebe, author of Craft Beer Revolution: The Insider’s Guide to B.C. 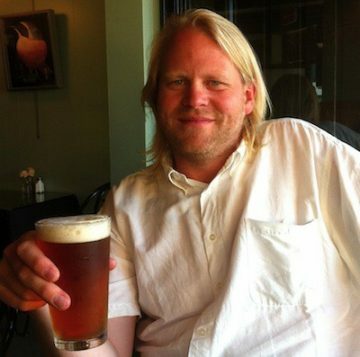 Breweries, is a widely-recognized journalist, public speaker, beer judge and craft beer expert. Joe has written for countless publications, as evidenced by his website, Thirsty Writer.